Your admission would be into the In-patient wards or Daycare ward. Admission can be during any day of the week, usually already pre-agreed between the patient and the admitting doctor. Usually you would have been informed by the clinic or hospital staff about your prior Guarantee Letter (GL) approval from your insurance company before your admission. Alternatively, hospital deposit payment using cash or credit card facility is also available on admission. We accept all patients, with or without insurance plans. The clinic and hospital are panels to many insurers, 3rd party administrator and commercial corporations. You can call the clinic counter at +603-3377 7864 for more details. Please click for more details…. You are most encouraged to call up the clinic in KPJ Klang at +603-33777864 or +6012-3760728 to confirm the availability or to book your appointments. Note: As case complexities, consultation duration and procedure needs differ between patients, the consultation is still based on first- come-first-served basis . You are however stil most welcome to enquire or book an appointment. By leaving behind your contact number, we will be able to contact you if there are last minute changes. (the doctor may still get called away to attend to emergencies or delayed by surgery at the last minute within the hospital premises). We will try our best to meet your needs. Please bring along your Malaysian Identity Card MyKad (if adult) or MyKid (if children) for the registration, or the Passport if you are a foreigner/visitor to this country. If you have had prior/recent medical consultation prior to this visit, you are advised to bring along relevant medical reports of any blood tests, ultrasound/Xray/CT/MRI scan reports. You may even bring along your medications or digital photos of them. Referal letters from a GP (general practitioner)/your famliy doctor and/or or a Guarantee Letter of payment may be needed for: • corporate clients using company insurance • some personal insurance coverage Copies of medical insurance cards (personal or corporate) are needed in event a hospital admission is advised Please confirm with you insurance agent/HR (human resource) department with regards to these additional documents You are most welcome to liaise with the Clinic Assistants in KPJ Klang at +603-3377 7864 to deal with this matter to ensure a smooth and hassle-free registration. The specialist’s fee and procedure charges are governed by the latest 13th Fee Schedule 2013 (a government-regulated doctor’s fee schedule on proposed charges enforceable nationwide) Here, we understand the concerns of the increasing high cost of healthcare. 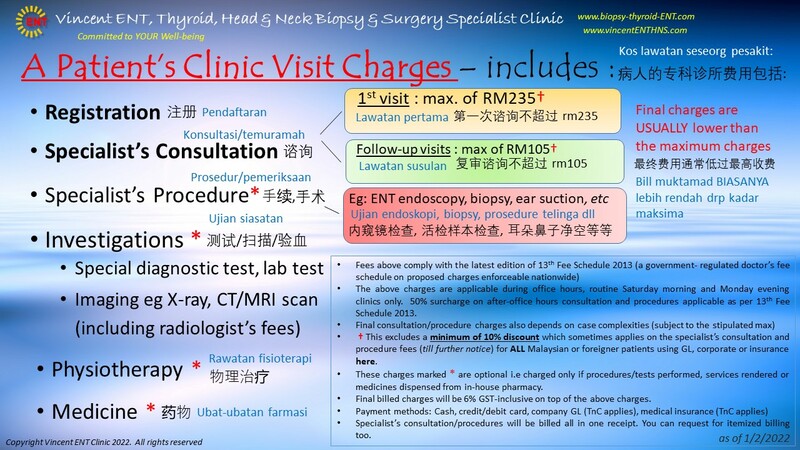 In KPJ Klang, a minimum of additional 10% discount is given on the doctor’s stipulated consultation and procedure fees For more details on charges……click here.. For payment, the hospital accepts cash, credit or debit card, or approved corporate Guarantee Letters. You are most encouraged to call up the clinic in KPJ Klang at +603-33777864 or +6012-3760728 to confirm the availability or to book your appointments. Note: As case complexities, consultation duration and procedure needs differ between patients, the consultation is still based on first-come-first-served basis . You are however stil most welcome to enquire or book an appointment. By leaving behind your contact number, we will be able to contact you if there are last minute changes. (the doctor may still get called away to attend to emergencies or delayed by surgery at the last minute within the hospital premises). We will try our best to meet your needs. Please bring along your Malaysian Identity Card MyKad (if adult) or MyKid (if children) for the registration, or the Passport if you are a foreigner/visitor to this country. If you have had prior/recent medical consultation prior to this visit, you are advised to bring along relevant medical reports of any blood tests, ultrasound/Xray/CT/MRI scan reports. You may even bring along your medications or digital photos of them. Referal letters from a GP (general practitioner)/your famliy doctor and/or or a Guarantee Letter of payment may be needed for: • corporate clients using company insurance • some personal insurance coverage Copies of medical insurance cards (personal or corporate) are needed in event a hospital admission is advised Please confirm with you insurance agent/HR (human resource) department with regards to these additional documents You are most welcome to liaise with the Clinic Assistants in KPJ Klang at +603-3377 7864 to deal with this matter to ensure a smooth and hassle- free registration.